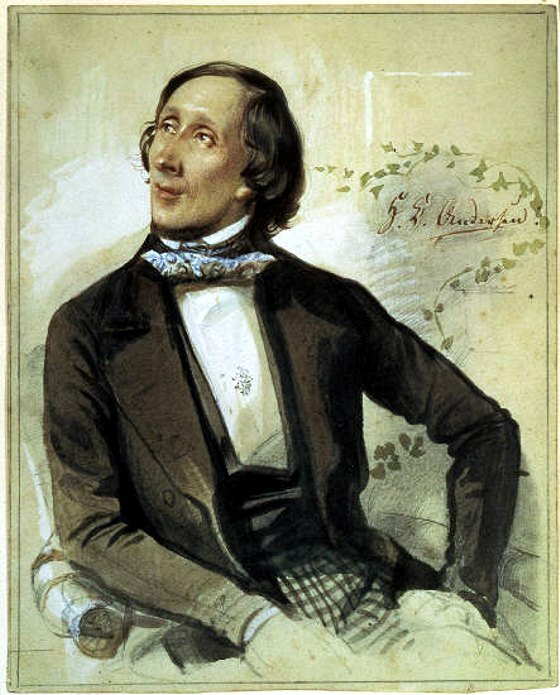 Hans Christian Anderson Turns 205 Today! – Rockabye Baby! Hans Christian Anderson Turns 205 Today! One of the greatest storytellers to ever live, Hans Christian Anderson, is celebrating a birthday today. He would have been 205, if he were an immortal. He wrote a few little ole stories you may have heard of, such as "The Little Mermaid," "Thumbelina," "The Emperor's New Clothes," "The Princess and the Pea," "The Ugly Duckling," and many more. His stories have been translated into over 150 languages and have been made into many films. Anderson, originally from Denmark, was told that because of his dyslexia, he would never become a writer at a young age. He lived quite a dark childhood, being abused in order to, as he said, "build character" and he had bouts of depression. But he didn't let others discourage him, and in 1835 he published Fairy Tales. It not sell well at first, but would eventually become one of the most well-known books of all time. One interesting story about Anderson is that he was a great fan of Charles Dickens, and when he got a chance once to stay with the famous writer, he stayed for five weeks, not even noticing that Dickens kept dropping hints for him to get out. It's said the character Uriah Heep in Dickens' David Copperfield was modeled after Anderson. Well, he meant well, even if he was a bit weird. But come on, what guy who writes Fairy Tales isn't a bit odd? Anderson has been celebrated around the world since his death in 1875 with statues and even a $13 million theme park in Shanghai, opened in 2006. The park features games related to the fairy tales and was chosen as the park theme because he was a "nice, hardworking person who was not afraid of poverty". To celebrate Anderson today, jump online and print out some stories of his to read to your kids. Here's a good place to start! Spot up for this write-up, I seriously believe this website needs a great deal much more consideration. I’ll apt to be once a lot more to learn additional, appreciate your that information.